Nigel, from Kentdown Mushrooms, grows a huge variety of Japanese mushrooms, including shimeji (shown here), enoki, and our favourite, his deliciously meaty eyringi variety. Nigel’s mushrooms are grown without artificial fertilizers or pesticides, and arrive at our doorstep still in their growing compost. 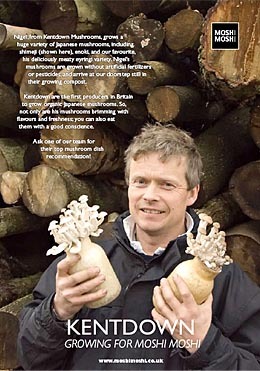 Kentdown are the first producers in Britain to grow organic Japanese mushrooms. So, not only are his mushrooms brimming with flavours and freshness; you can also eat them with a good conscience. Ask one of our team for their top mushroom dish recommendation! Air freighting food half way around the world in neat vacuum packs tends not only to lose a lot of flavour and nutritional value, but also falls foul of the food mile issues. that is why Moshi Moshi has developed relationships with local growers of vegetables in Kent and Sussex, and is increasingly looking to buy directly from fisherman from around the British coast.